This groundbreaking case takes visual advertising to new levels! Enjoy the grassroots views of fertile farmlands without even leaving your home or office. The vivid full-color photographs provide your company with a full 13 months of advertising exposure. The beautiful staple-bound calendar clearly identifies holidays and other special remembrances. Calendar has a durable UV-coated gloss paper cover. Perfect promotional tool for grocery stores, co-ops, state parks and any other business that finds value in homegrown nourishment. 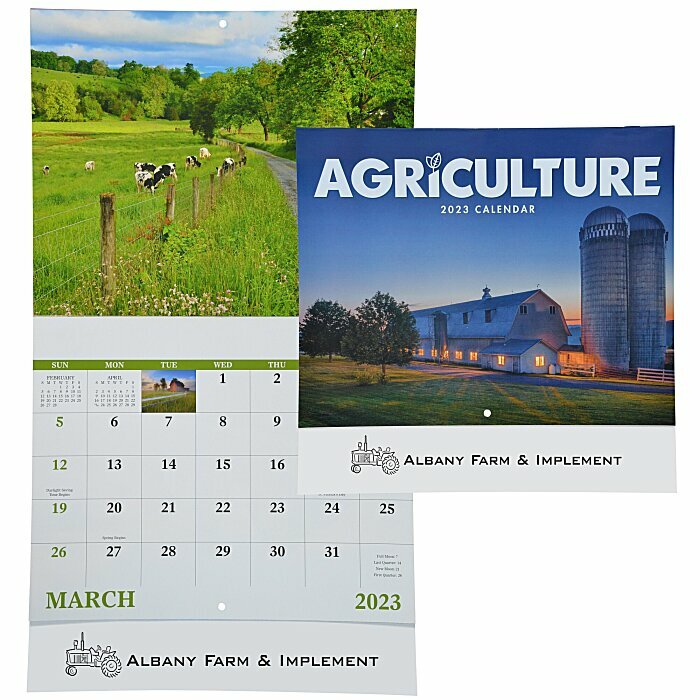 For the spiral-bound version of this calendar, see item #112070-SPAgriculture Calendar - Spiral. Your price includes a one-color imprint on front bottom of the calendar.